As I said yesterday in my wrap up there was three new publishers last month and here is another Noir press is a new small press focusing on Baltic fiction. They contact me and said This may be perfect as my first book from Lithuania as I had yet to review a book from there. Laura is a prize winning writer this book won the EU prize for lit .She studied Lithuanian become a Journalist and then a writer she has had a number of books published and translated into a number of languages this is her first to be into English and the first by a living Lithuania writer to be translated to English. 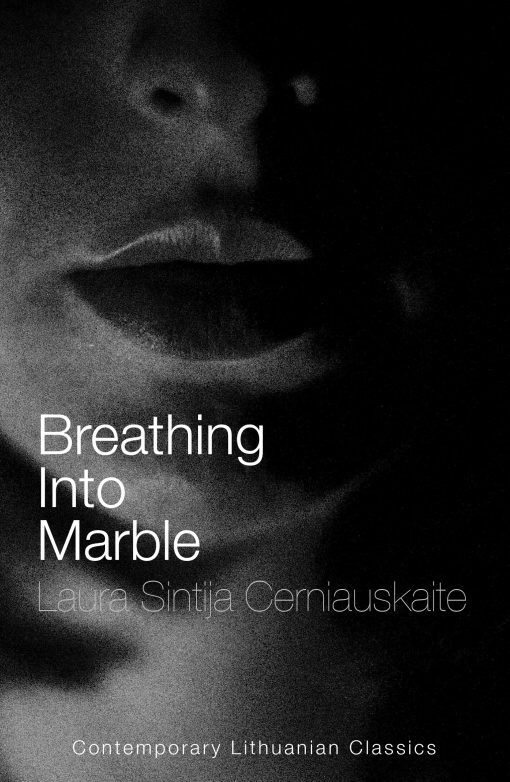 Breathing into marble is a story of family Isabel , who has a son Gailus , but this lad is suffering from Seizures which are getting worse, the family are trying the best for him. The Isabel meets an orphan Ilya whom she decides they are going to adopt to help their son and also give him some company.This new arrival to use the old saying is like setting a cat amoung the pigeons and he is trouble he wrecks this quiet families life .What we see is the ripple effect of his arrival on how people get effect by one event .The mother and father trying to maybe replace the faulty child with a new one but he isn’t no this six year cause a rift and doesn’t take to his new step brother . Galius had never met a person who took up so little space “Its like ILya always trying to become smaller ” he said to Isabel .He behaved as though he was not two but ten years older than his brother. He would not complain to his mother when things began disappearing from the drawers of his desk – pencils and his Tragi-comical everyday reflections – what he called the pieces of paper with his scribblings on them. The two brothers meet and the older orignal son observes something about his step brother . This is a tough one to describe in her winning interview about this book for the EU lit prize she notes the books isn’t plot driven its a book of psychology of the human soul she says it is to see how people react to one event the event here is a death at the heart of the story that turns the wife and husbands world upside down . This is like a lot of new fiction around europe about famlies in the worst points , I felt a connection to The Boy which I reviewed last year another novel dealing with the fallout of a child’s death. This also seems to be part of a group of writers In Lithuania writing Noir fiction another influence I felt is Simenon roman Durs novels those psychological novels he wrote about the darker side of human nature at times and how we all react in certain situations . This is a dark look into ome couples past and secrets they had to bury many years ago , death and recovering or trying to recover from it . Thank you for calling attention to this. Sounds quite intriguing, and I certainly have never read anything from Lithuania. What an exciting time as new publishers bring new writers to us. The UK may have turned its back on Europe but at least we can still read their books!